Kate (Charlotte Rampling) and Geoff (Tom Courtenay) are in the process of planning for their upcoming 45th wedding anniversary. Before he had met Kate, he and his ex-fiance, Katya, had been in love and walked together on the mountain, but she fell down a crevasse. Now, years later, Geoff receives a letter informing him that the body of Katya had been found on the mountain after the ice thawed. His marriage with Kate gets put to the test because of that letter while his buried emotions as well as those of Kate's are in the process of thawing as well. The life of a married couple has not but put under the microscope so compellingly and profoundly since Ingmar Bergman's Scenes From a Marriage. A lot happens throughout 45 Years despite that there's no explosions or chases or villains or anything that would require CGI (a.k.a. "standard effects). Instead, there's plenty of humanism in all of its complex forms which should be called truly special effects. Every scene brims with humanism in way that makes you feel as though you were watching a documentary. Much of the film takes place within Kate and Geoff's humble abode, but talented writer/director Andrew Haigh avoids making the scenes feel stuffy, melodramatic, or overly theatrical. Haigh also avoids the use of flashbacks and a narrator which would have been lazy and distracting. He keeps the film very lean, but concurrently gives you a lot to ponder about given what happened in the past and the complex feelings as well as epiphanies that are rising to the surface in Kate and Geoff's 45-year marriage. Aesthetically, everything from the set design to the weather and even the lighting and use of music help to enrich the film even further without pounding you over the head. None of the subtlety or warmth would be able to radiate if weren't for the impeccable acting talents of Charlotte Rampling and Tom Courtenay. Both of them should be commended for finding the emotional truths of their roles and giving performances filled with nuance and charisma. 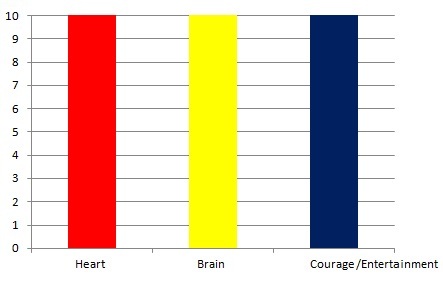 They're also capable of conveying many emotions even during the quiet moments. Essentially, for 93 minutes, you'll forget that you're watching Charlotte Rampling and Tom Courtenay because they essentially become their characters. The fact that 45 Years manages to be so quietly powerful and engrossing in only 93 minutes is yet another of its many strength. Haigh seems to grasp the concept that "less is more." Yes, perhaps a different writer/director would have provided you with more scenes of Kate and Geoff's married life before Geoff opens the letter, but Haigh is the kind of rare filmmaker who actually trusts your intelligence and imagination as an audience member. 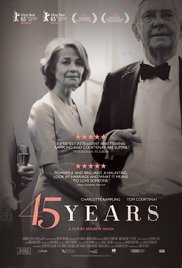 45 Years is essentially everything that the much bigger-budgeted, overlong and dull By the Sea, another recent dissection of a marriage on the rocks, wishes that it could have been: profound, haunting, tender, warm, captivating, intelligent and brimming with humanism from start to finish. This is the kind of film that you'll want to re-watch many years later to understand and to appreciate it from an entirely different phase of your simply complex life. Number of times I checked my watch: 0 Released by Sundance Selects and IFC Films. Opens at IFC Center and Lincoln Plaza Cinemas. Questions? Comments? Please click here.